Yoga teacher Grace is confronted with a breast cancer diagnosis, forcing her to rediscover the yoga principles she has taught for years. UNLV Opera premieres State of Grace at 7:30 p.m. Oct. 11 and 12 in the Judy Bayley Theatre. 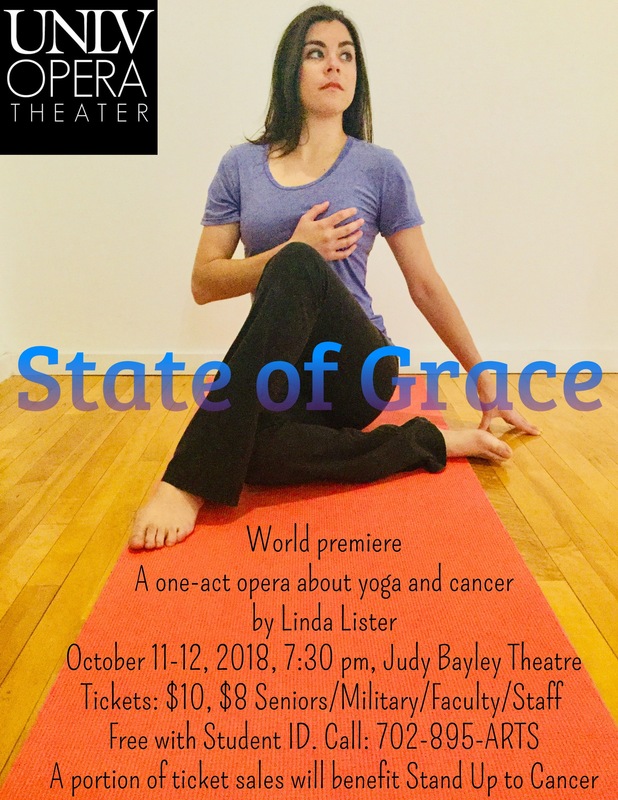 State of Grace is a one-act opera by Linda Lister, associate professor of music, director of UNLV Opera, and author of Yoga for Singers: Freeing Your Voice and Spirit through Yoga. In the opera, a yoga teacher named Grace is confronted with a breast cancer diagnosis that forces her to rediscover the yoga principles she has taught for years. This world premiere of State of Grace stars mezzo-soprano Erin Gonzalez as Grace, with Hunter Rose Turner as her cover/understudy. The cast includes Casey Dakus and Tyler Urbano, cover/understudy, as cancer survivor and new yoga student Mary; sopranos Emily Clements and Lisa Elliott as Instagram yogini Felicity; tenors Ranon Pador and Matthew Sink as the friendly jock Randy; and bass-baritones Aaron Pendleton and Andrew Williams as the hippie Leif. Sopranos Moriah Berry and Tamara Richards share the dual role of the doctor and yoga teacher Breezy. Tickets are $10. Discounts are available. Students can receive free admission with their student ID. Tickets are available at the Performing Arts Center online or by calling 702-895-ARTS (2787).